(Santa Ana, California) – The finest-known 1885 U.S. Trade Dollar that recently sold for a record $3.96 Million has been crossed over and now is in a Professional Coin Grading Service (www.PCGS.com) Gold Shield® holder. Within a few hours after placing the winning bid during the Heritage Auctions Platinum Night auction at the Florida United Numismatists Convention in Orlando on January 10, 2019, collector Dell Loy Hansen of Utah submitted the historic coin to PCGS for crossover service. 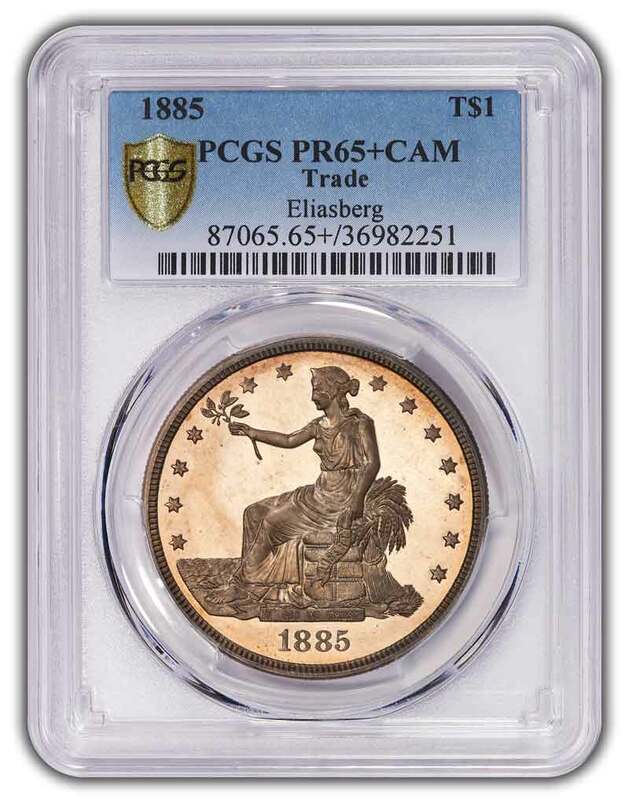 It is now encapsulated as PCGS PR65+CAM. "The objective of the D.L. Hansen Collection is to build the most complete collection of the highest quality of U.S. coins from 1792 to present day. As some have called it, the Greatest Collection of All-Time, we simply refer to it as the 'Eliasberg Quest' and it has certainly been the most exciting thing that I have participated in numismatically. The addition of the 1885 Proof Trade Dollar was an incredible experience as it adds another great rarity to the already amazing collection. As the coins are all registered in the PCGS Set Registry, the decision to cross the coin to PCGS was one that Mr. Hansen wanted to make for uniformity, so that it would solidify another fantastic addition to the already historic collection." "What a fantastic honor to have this coin come through our grading room at my first show as PCGS President! It's a true honor to have our Set Registry program host Mr. Hansen's 'Eliasberg Quest,' and we look forward to seeing what he acquires next," stated PCGS President Brett Charville. With a grade point average of 68.736, the D.L. Hansen Trade Dollar Proof Set is now 100 percent complete and ranked as the number one proof Trade Dollar collection, 1873 to 1885. The listing for the entire set can be viewed in the newly redesigned PCGS Set Registry®. Professional Coin Grading Service was established in 1986 and now authenticates, grades and certifies coins from over 100 countries. In addition to its international headquarters in Santa Ana, California, PCGS has submission centers in Europe (www.PCGSEurope.com), Hong Kong and mainland China (www.PCGSAsia.com). The popular PCGS Set Registry (www.PCGS.com/setregistry) now contains more than 95,000 U.S. and world coin sets.